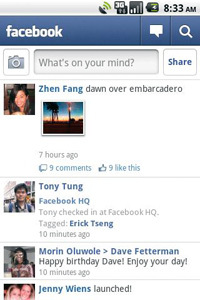 Facebook for Android v1.7.0 is the latest update from facebook. 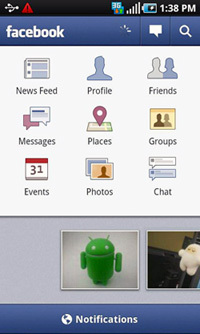 Facebook for Android v1.7 is now available for android users in Android Market to download. Facebook for Android is the official app for android from Facebook, using this app makes it easy to stay connected and share views with friends.you can share status updates from your home screen, check out your latest News Feed, Chat with your friends, review your upcoming Events, look at your friend's user information and wall, upload and share photos, check your Messages, check in to places for Deals,watch videos and many more. The Update Received by Facebook for Android brought some anticipated changes both to Interface and sharing. Facebook for Android v1.7 now has the ability to share posts by "privacy controls on posts" as in web version. Another cool feature is " Pull to Refresh" which is already available in many mobile apps, you can also tag friends in photos, places and posts. The update also brought New Design for Profile and Group walls, improved Message and Notifications, improved swipe interface for photo's Browsing, and fixed some performance and Crashes issues.